Bead Soup 2014 is Served! 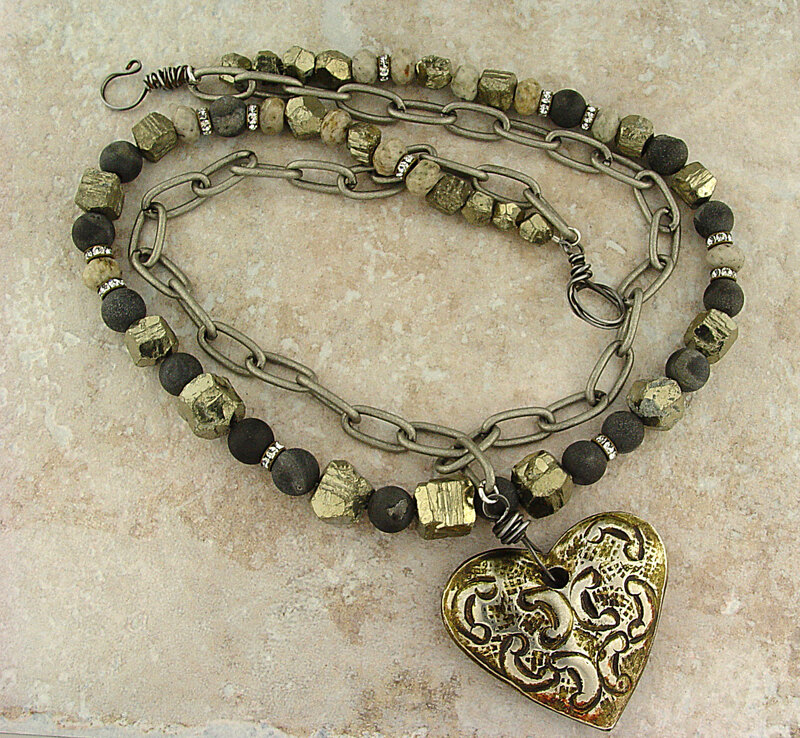 I took her amazing metal heart focal and added it to some very heavy gun metal link chain and then added her steel gray wired hook and loop clasp to that. Part one finished. To that I added a chunky, heavy strand that included the soft gray rondelles, the dark gray lava like rounds, interspersing the sparkly spacers…all sent by Barb. I included a strand of BIG Fools Gold nuggets that I got in Tucson years ago and never knew what I’d do with them. Voila! Industrial Chic is complete. Here’s a few more shots, including matching earrings that used the “spring” connectors that Barb sent. Close up of the focal. And the clasp. And some matching earrings. Be sure to check out what Barb did with the soup I sent to her. You can find her here. 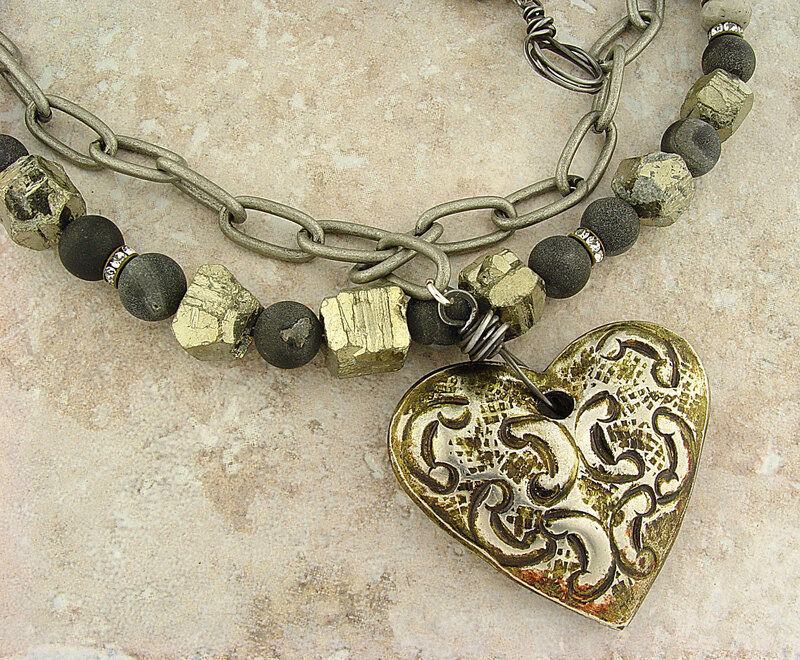 And then check out Lori Anderson’s blog page for the scoop on this year’s Bead Soup Blog Party and a list of other participants! Mine will be up by morning…check back to see what I made with the great soup I got from my partner Barb Solem. 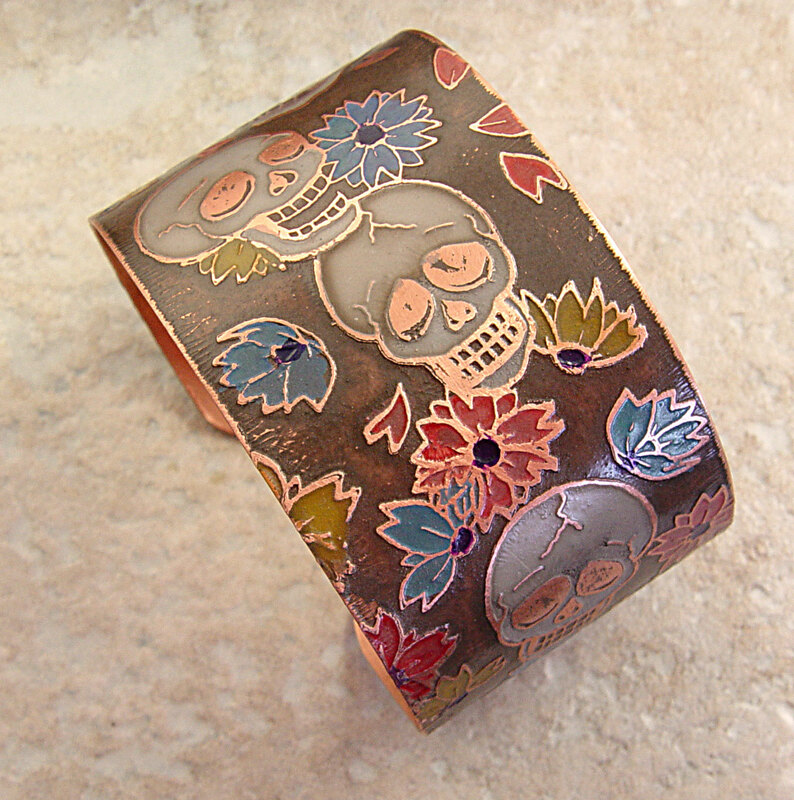 Dia de los Muertos (Day of the Dead) a Mexican holiday celebrated throughout Mexico and the Southwest. The holiday focuses on gatherings of family and friends to pray for and remember friends and family members who have died. The celebration takes place on October 31, November 1 and November 2, in connection with the Halloween, All Saints’ Day and All Souls’ Day. That’s the basics. 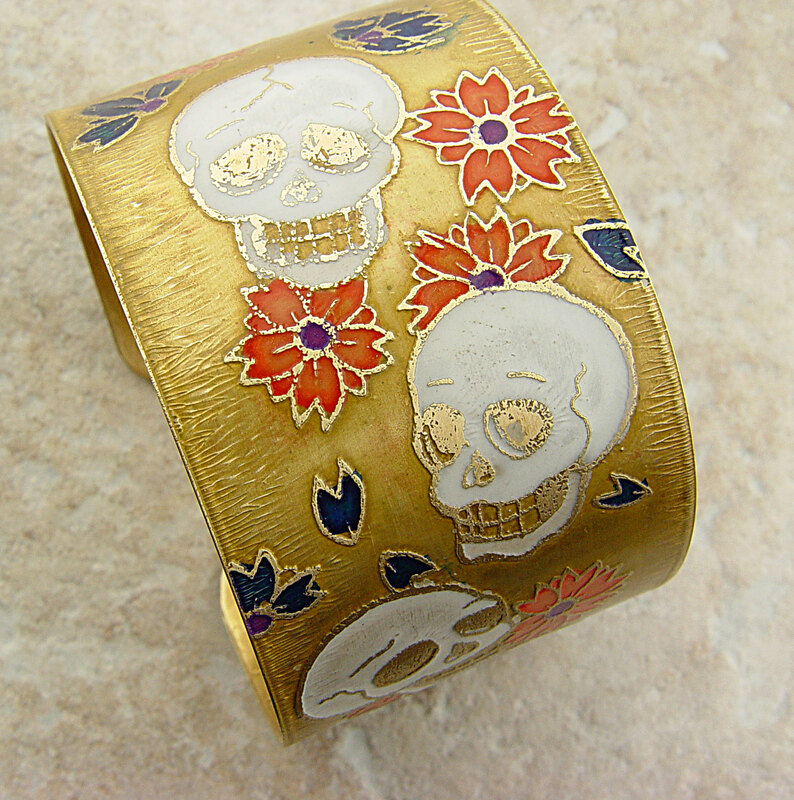 Sugar Skulls and marigolds are central to the theme and along with painted faces and decorations, those elements make their way into jewelry. 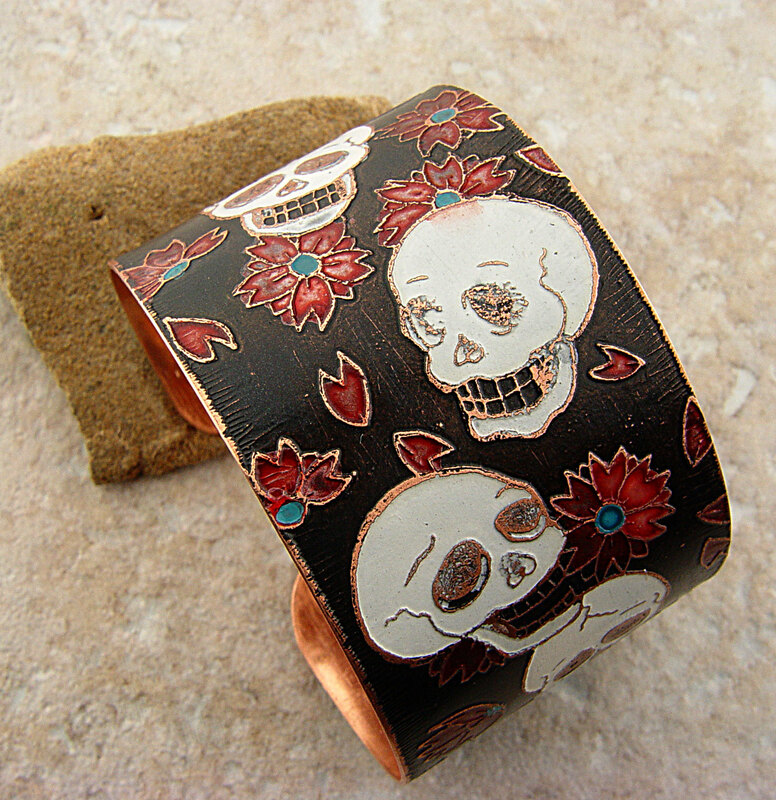 It’s time to reveal what we made for the Halloween/Day of the Dead Jewelry blog hop! sponsored by Suburban Girl Studio. I’ve got cuffs! 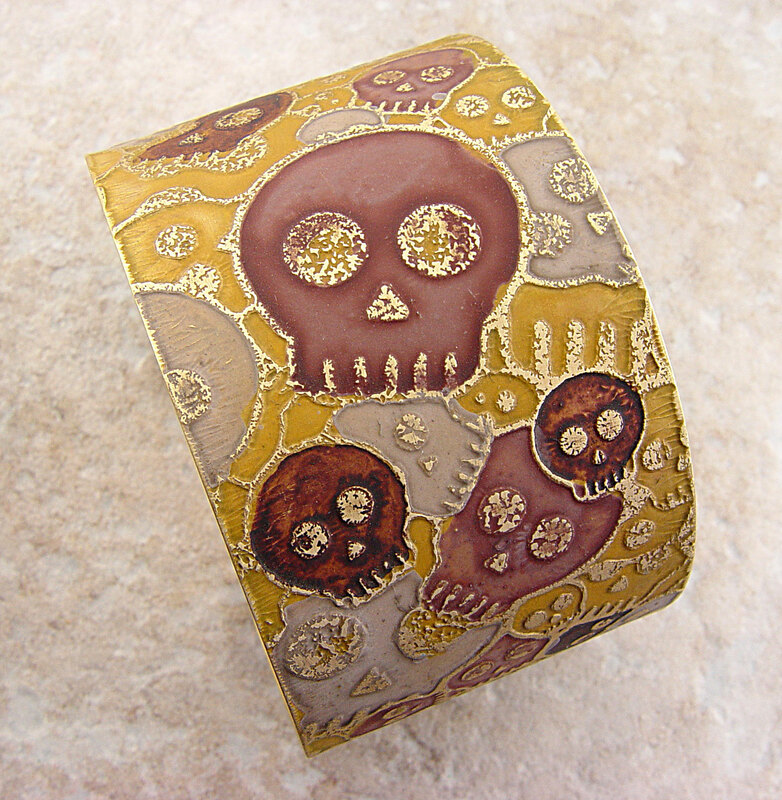 Lots of etched cuffs with sugar skulls, marigolds and bright colors. All of the above were etched and colored by me. 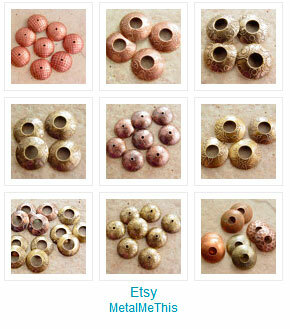 Colors are from Color Me This metal patinas. 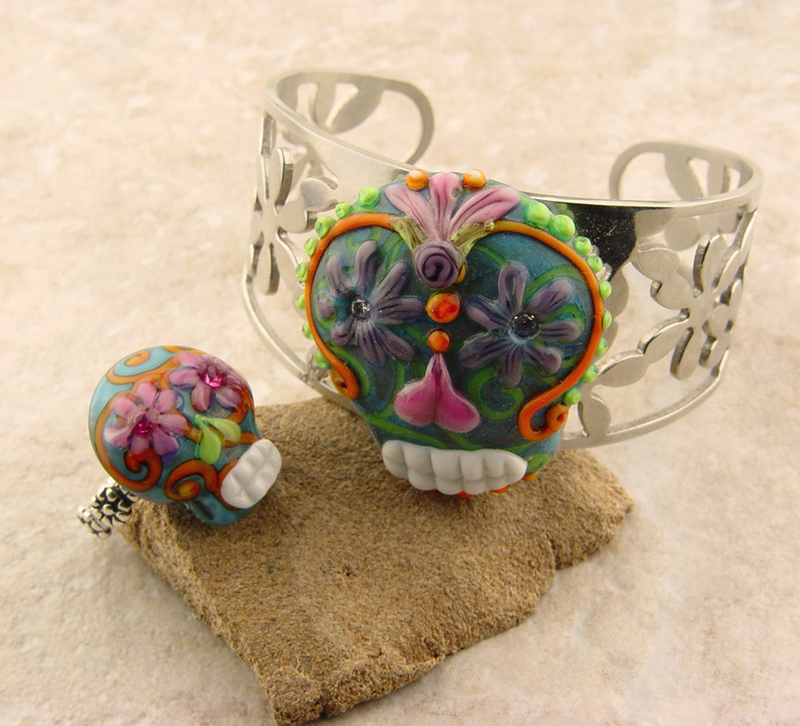 In addition to the etched versions, I have some amazing glass sugar skulls from Torch by Night Lampwork. One is ring size and the other is cuff size. Both are on interchangeable Sirius System findings from McDuck Creations. Slipping in under the wire with this challenge on Artisan Whimsey…I’ve been out of town for a short, but much-needed break with my parents in Colorado Springs! 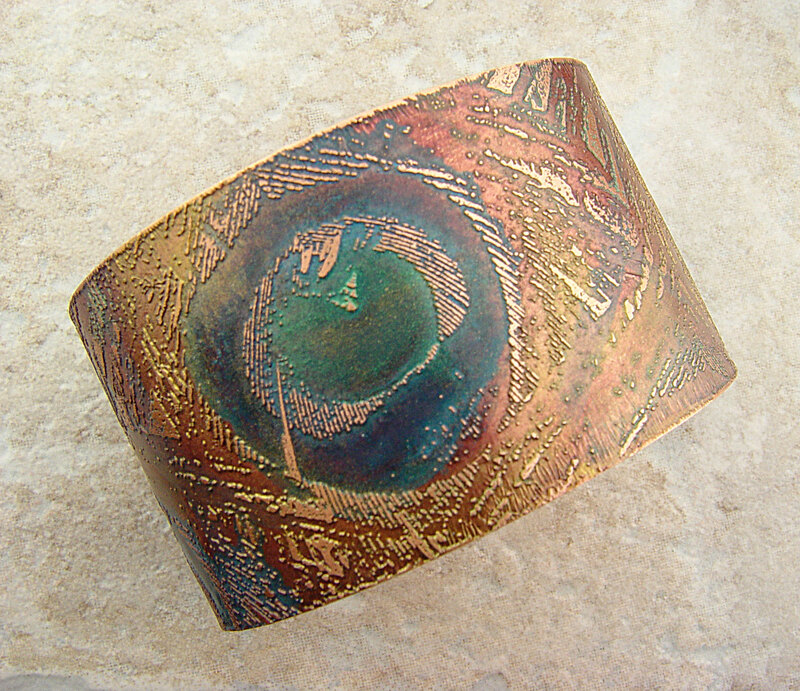 I have been making etched copper and brass cuffs for a couple of years now, selling them on Etsy, Facebook and at shows. I love the etched textures and I love coloring them. One of my favorite patterns is a background of peacock feathers. 7th Bead Soup Blog Party Reveal is Here! 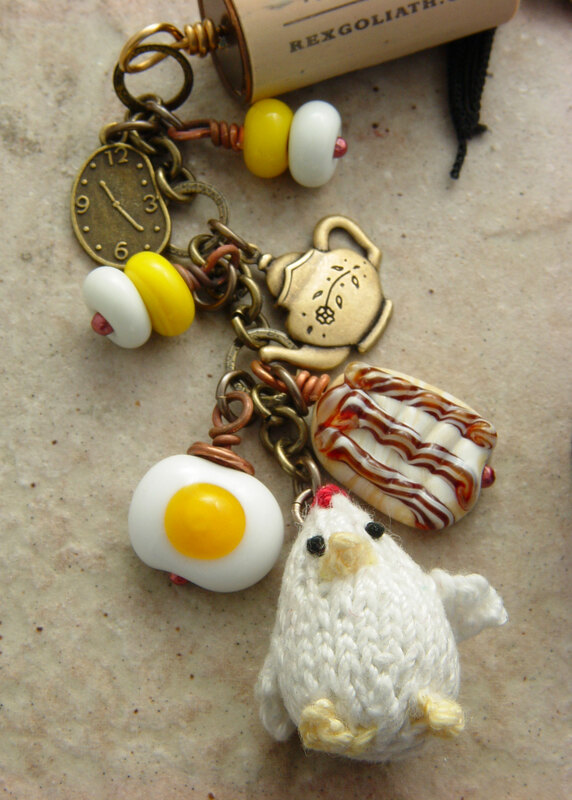 I thought her Bacon and Egg beads were so cute that I kept the theme going. 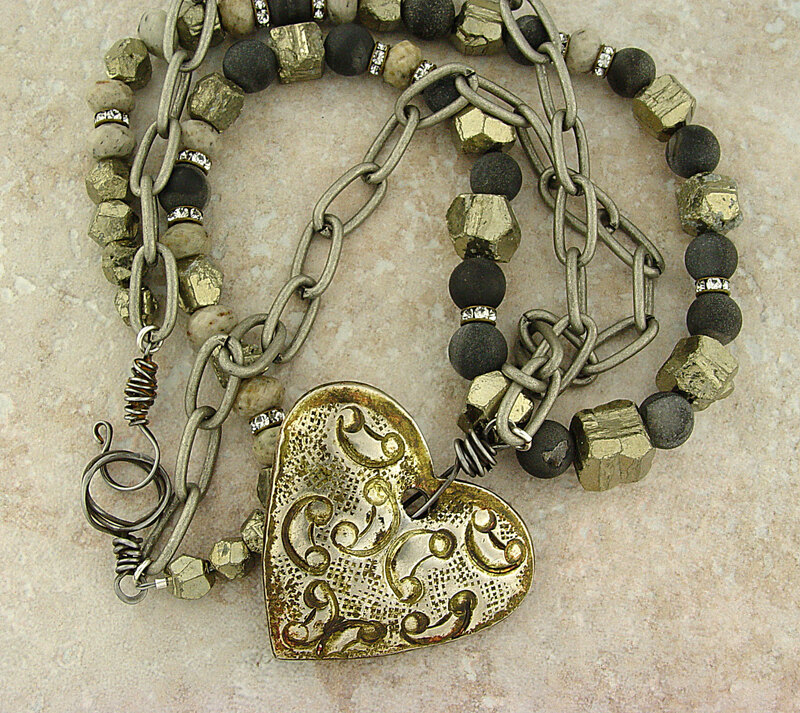 I used mixed metals: brass wire, copper and brass jump rings, brass chain and lots of dangles. I’ve been making Cork Pendant necklaces for a few months and kept looking for a cork that had a chicken or something “fowl” on it. 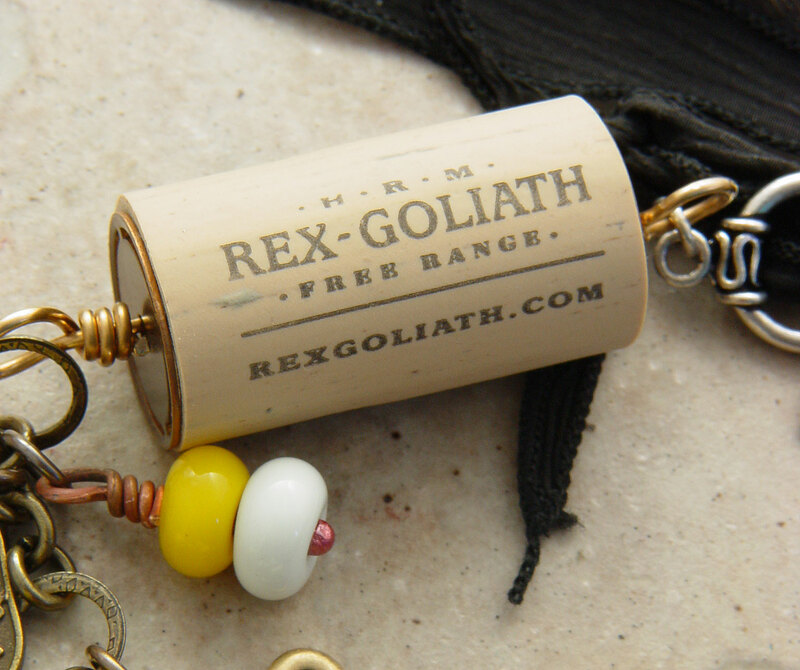 I ended up finding this one from Rex Goliath Pinot Noir that says “Free Range” on it… a stretch perhaps, but it works for me. 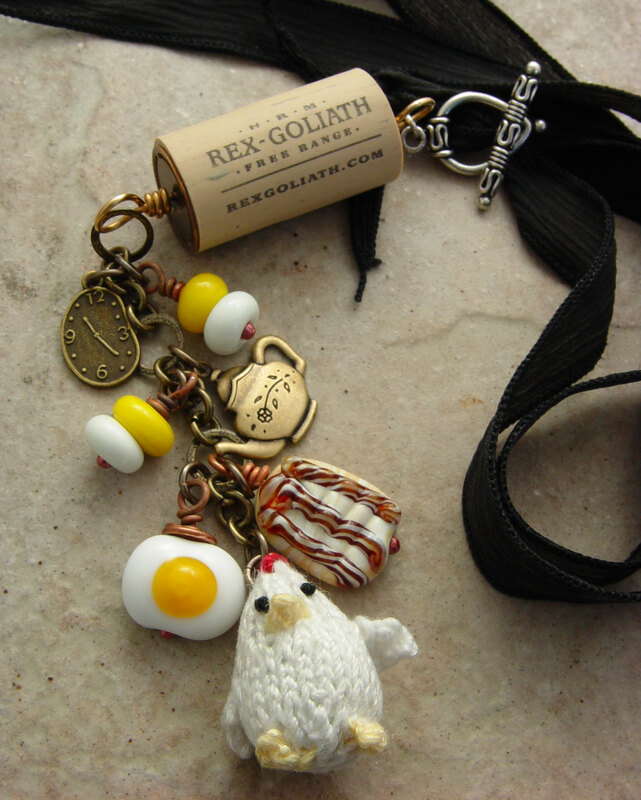 Here’s the close-up shot of my pendant with Mallory’s focals, a cute, tiny crocheted chicken, and various other brass and copper dangles and baubles. 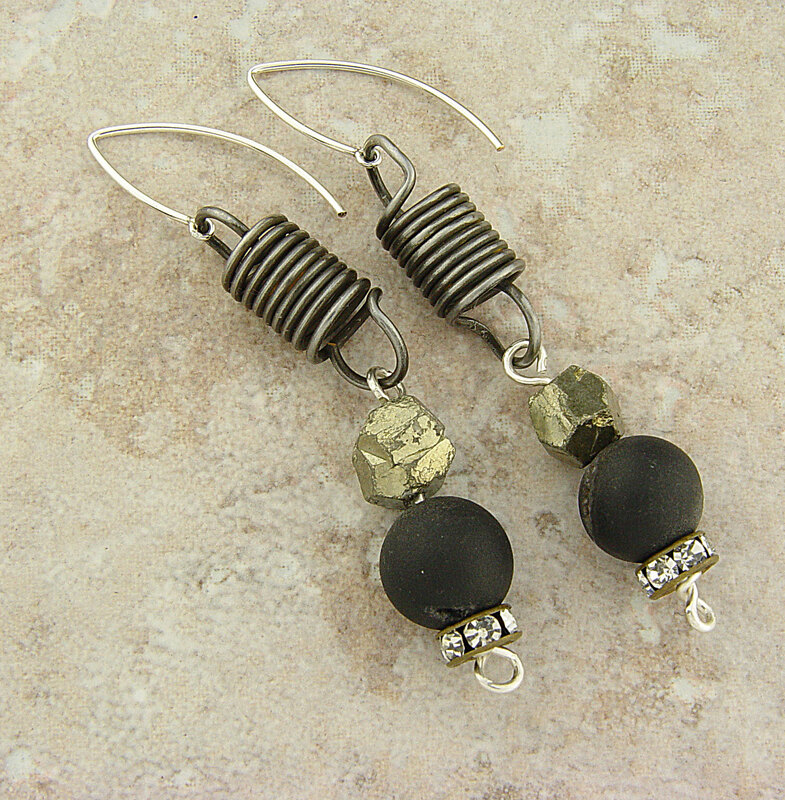 I made some of Mallory’s other glass beads into “egg” dangles, too. Here’s the full shot showing the silk ribbon for the necklace hanging off the toggle that Mallory sent me. 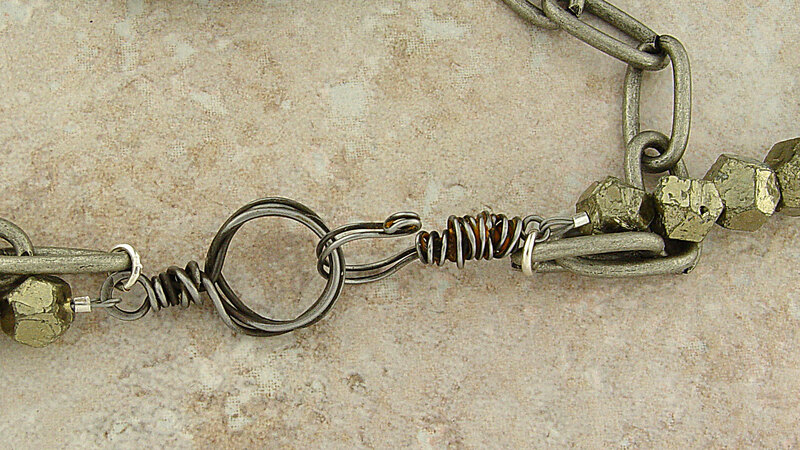 I like using toggles this way in front and it makes the pendant detachable, too. 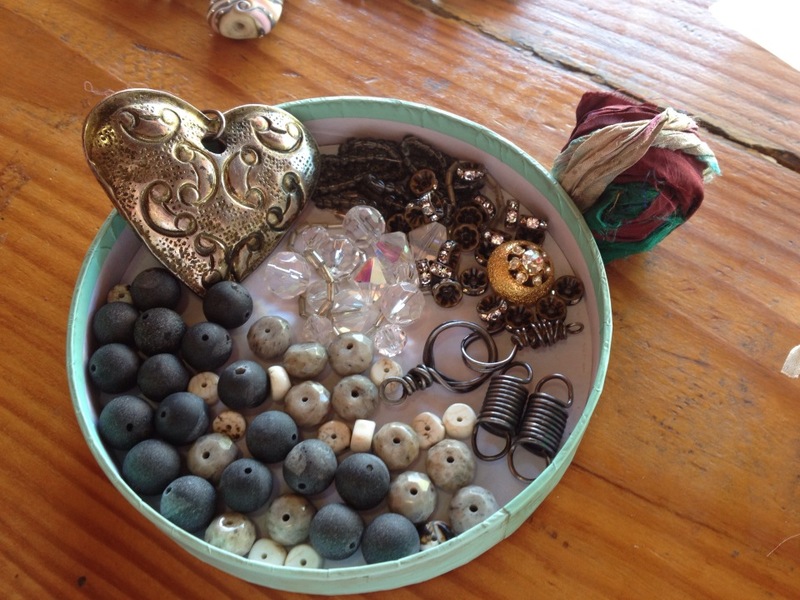 I hope you’ll check out Mallory’s blog, “For the Love of Beads,” to see what she made with the beads I sent her. And then settle in to check out a couple hundred other participants! You can find the links here at Lori Anderson’s blog. And there will be two more BSBP reveals coming in the next few weeks! PS. The cute crocheted chicken is by Cori Ruszkowski…check out her work here. Welcome to 2013….I’ll update where the heck I’ve been in another post, but for now I could have sworn I posted about my Bead Soup Blog Party partner Mallory Hoffman before this. Mea culpa, Mallory! Mallory is a wonderful online friend and glass bead maker who I’ve known for several years. She was a tremendous help in my booth at Bead & Button last year…my first chance to meet her in person. 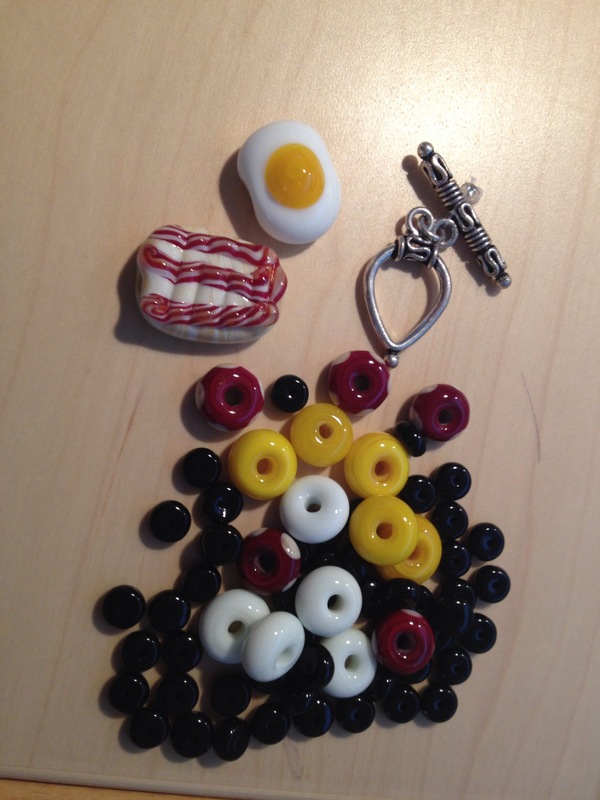 This is what Mallory sent me: The greatest Bacon and Egg focal beads along with a silver toggle and various other colored glass accent beads. Check back tomorrow to see the real reveal! Thanks to all who stopped by to comment on my blog and to shop in my store during the Artisan Whimsey sale! It was a busy week with lots of great sales going on. Stop by the Artisan Whimsey site and look around, too. Lots of great information there. I’m happy to announce the winner of the $25 gift certificate is Carolyn Collins of Sparkling Waters Studios. Congratulations! Have fun shopping! I’ll be in touch with details. AND I was pleasantly surprised yesterday to find out that my Bead Soup Blog Party entry for Kalmbach Jewelry Books was chosen as a winner among the office staff! I’ll be receiving a copy of the new Crystal Jewelry Inspiration book in January. The necklace is on its way to my mother’s for her 81st birthday (along with some matching earrings). She’s been my biggest supporter and fan of my jewelry efforts for years and years. I know she’ll be pleased to know that others loved it too.